Register now for an upcoming OSC Lunch & Learn session and discover ways to save your district thousands in a variety of areas. Our Lunch & Learns put you in touch with our OSC Preferred Partners, many of which offer discounted products and services to our member districts. Lunch is free! All events are held a the ESC of Northeast Ohio (6393 Oak Tree Blvd., Independence). We hope to see you there! 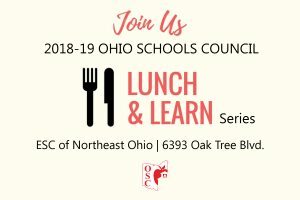 The Ohio Schools Council will host a Lunch and Learn event on Wednesday, Oct. 17, highlighting our new partnership with Dairy Savers which works to assist our members with cost recovery on everyday dairy items as well as assistance with Uniform Guidance Procurement. OSC awarded local fresh fruit and veggie vendor, Farm Fare, will also be on hand to discuss their ordering process, Ohio produce shelf life, program changes and future expansion.